The European Union needs to increase funding to help out the economically dislocated, or it will face more exits. The recent UK referendum was a vote of no confidence to the entire system. The leader of the ruling party, the opposition party, the majority of trade unions, banker unions, scholars, research institutions, and leaders from every corner of the planet all expressed strong support for the Remain campaign. The British public rejected the authority of each one of these. An easy explanation would be that madness had prevailed in Britain, that empty promises like the influx of hundreds of millions of pounds into the country beguiled the people, that dreams of a long gone empire have clouded their judgement. Still, there could be a method to this madness. According to a breakdown of the vote, the results look like a clash between the young and the old. Two-thirds of voters under the age of 24 chose to remain in the EU, while 61 percent of those over 65 preferred to leave. One way to look at this result is to consider that the first demographic has experienced all the benefits of an integrated Europe. The European Erasmus student exchange program has grown by 115 percent in the UK in just seven years. The city of London has become Europe's financial center and offers great jobs for those with good education. However, older people have seen something that the younger have not. Before the Thatcher era, Britain had a strong state school system, an overall mix of public and private ownership, a less prominent division between London and the rest of England, and a certain pride in being the working class. Take a look at the age chart of the vote of the referendum. Those who were in their twenties, thirties, and forties when Thatcher came to power voted predominantly for Brexit. They were the only ones among the voters on Thursday who were able to compare what came before Thatcher's reforms to what came after. True, Britain was in a miserable state before her reforms and obviously needed a change. Nonetheless, the extent and harshness of this change left behind irreparable damage. Her neoliberal reforms, in the words of historian Tony Judt, tore the fabric of British society. A stark division of the classes emerged that has been deepening ever since. The zero-hour contract, legally established in 1998, allows an employer to hire someone, while committing to no more than zero hours of work for the employee. Thus workers are often obliged to be available at any time to be called to work, while they have no idea whether they will have enough hours during the month to pay the bills. This contract was rarely used before the 2007 crisis. However, in the past 10 years, the number of people working on it has increased eight-fold to 800,000 in 2016. In this manner, Thatcher's legacy of a class-divided society has collided with almost a decade of economic crisis. Promises from both parties in Britain sound empty. The calls from political leaders, banker unions, and foreign politicians all seem to come from an elite that is far removed from the poorer part of the voters. The triumphant words of Nigel Farage, the far-right UK Independence Party leader who has been the principal proponent of Brexit, says it all: "a victory for ordinary people, against the big banks, big business and big politics." Of course, some gullibility, ignorance of basic economic principles, xenophobia, and ugly nationalism were also mixed into the Brexit vote. Nonetheless, the vote was a conscious protest against elites and a deliberate attempt to punish the "system." Flourishing financial institutions in London, which serve mainly European clients, have already made plans to relocate to the continent. Both major political parties are in disarray, leaderless. The British will probably manage somehow. They just have to conclude a favorable trade agreement with the EU, and it will be as if nothing happened. Perhaps they will accept free movement of labor in order to maintain full access to the common market. It will mean ignoring the promises of the referendum campaign, but this wouldn't be the first promise forgotten by a populist leader, nor even the first promise ignored in this particular campaign. As the Social Democratic Party has urged, the British might even go back on the referendum. The worst consequences of Brexit may affect not Britain but the continent, where the stock market has sustained the heaviest loses. The true challenge will be to maintain the integrity of Europe. A long list of countries -- France, Netherlands, Denmark, Sweden, Austria, the Czech Republic, and others -- have been emboldened by Brexit and are candidates for the next exit. But if one of the Eurozone countries leaves the Union, it will have even more significant economic consequences than Brexit and will probably spell the end of the most significant peace project of the 20th century. Along with UKIP, a number of xenophobic parties have emerged in Europe in the late 1990s. Initially ridiculed, they have become monsters ready to tear apart the continent. One of these is Marine Le Pen's National Front in France. The same social discontent and economic divide that played a role in the Brexit vote help to explain Marine Le Pen's success. During the first round of the last regional elections in December 2015, the National Front was the leading party in the country. In certain regions it captured 40 percent of the vote. In the second round, the Socialist Party withdrew from the race in order to prevent the National Front from gaining a majority. Although the National Front couldn't win in any of the regions, it emerged as the strongest party in France. Unlike Britain, France had no Margaret Thatcher. It preserved many public enterprises, an extensive public schooling system, and strong labor unions. France also didn't undergo the kind of austerity measures its southern neighbors endured. And yet, France is the most likely country to follow Britain out of the EU. In the most recent sign of discontent, strikes by farmers, refinery workers, and railway workers have all paralyzed the country. Social injustice might seem an unlikely reason for the rise of the far right in France. Still, the EU common market and common rules have exerted a strong downward pressure on France's social standards and labor protections. Britain has its zero-hour contract, which has gained popularity during the crisis. Germany has come up with its "mini jobs," Belgium with "internships" (which allow an employer to pay a worker less than half the minimum wage), and Spain has its contratos basura (trash contracts). The combined effect of these contracts in these neighboring countries pushes French employers to produce stuff outside of France, since the European Common market allows them to relocate and import back to France at lower operational costs. Meanwhile, the same laws that protect certain workers ensure a high unemployment rate in France, which only swells the ranks of those angry at the French government and, by extension, the EU as well. Since both right and left parties pursue European integration, those disillusioned by European liberalization have no other refuge than the far right. Youth unemployment in Spain, Greece, and Italy is about 50%. Some Eastern Europeans have enjoyed well paid jobs, but large numbers of people in the region are receiving minimum wages that barely cover the cost of living. 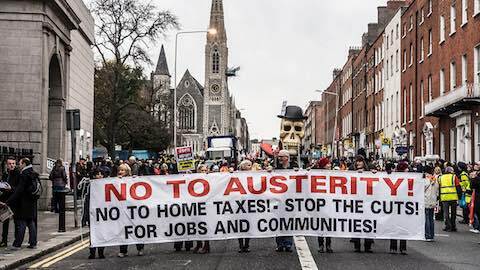 Austerity, loss of jobs, and inequality are all direct or indirect consequences of the EU. Normally, it is the left parties that cater to such constituencies. But the left is as committed to the EU as the right. Although the liberalization associated with the European project has negative consequences for the poorer parts of society, it remains invaluable. This liberalization has created one entity of Europe and provides a European identity to about 450 million people. It lifted the living standards in all European countries, especially in the poorer parts of the continent. It abolished violence on a continent that was knee-deep in bloodshed just a little over 70 years ago. This Europe is what 75 percent of young Britons voted for. However, if Europe is to avoid the British scenario, it should stop the tearing up the fabric of society. This answer cannot come from the individual states and the local social movements throughout Europe. After all, social reforms at the national level create competitiveness problems at the union level as France is showing so clearly these days. Rather, the response can only come from reforming the overall structure. The EU has designed wonderful programs to support regions with less economic activity and disadvantaged social groups. It has also created legislation for protecting the health and rights of the same British workers who voted against it. Yet judging by the rise of the far right, the EU's support for the most disadvantaged population is simply not enough. Its budget is not sufficient, especially in light of the challenges created by the common currency. The only way forward appears to be a federal budget large enough to stimulate the economies currently under austerity measures and create opportunities for the losers of globalization. Now all eyes are on Brussels and the conclusions that will be reached in the coming days. Will the EU take the necessary steps to expand its budget and increase investment into precisely those adversely affected communities where Euroskepticism has grown so strong? Courtesy Foreign Policy in Focus.